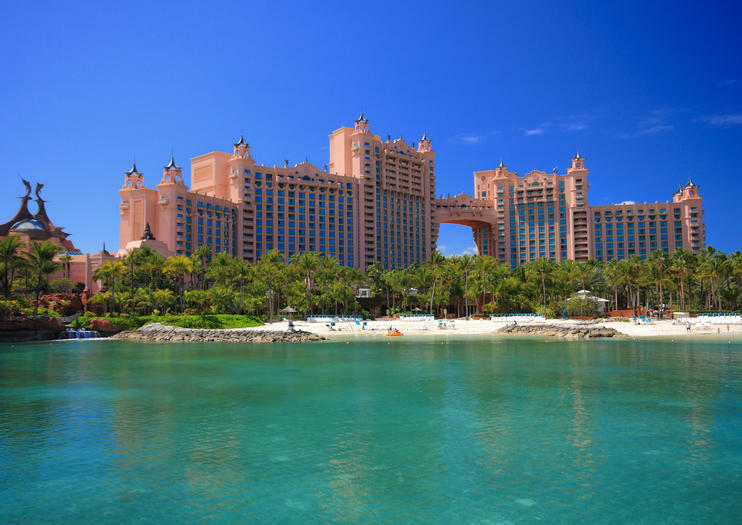 In Dubai, a hotel can be considered a top tourist attraction, and that’s certainly the case with the extravagant Atlantis Palm Hotel. The 1,539-room, ocean-themed resort occupies the top portion of the crescent of land surrounding the man-made Palm Islands, just off the coast of Dubai, and it includes 42 acres (17 hectares) of amusement and entertainment space. Even if you’re not a resort guest, it’s worthwhile to spend a day enjoying everything it has to offer. Many of the attractions are aquatic in nature. Prebook tickets to Aquaventure Waterpark, which houses 42 rides and attractions, including a near-vertical body slide. Dolphin Bay brings guests face-to-face with some of the ocean’s most endearing creatures, while a ticket to the Lost Chambers Aquarium sends you on a journey through mythical Atlantis, surrounding by thousands of marine animals, with upgrades available to scuba diving and ray feeding experiences. The Atlantis Palm Hotel also hosts some of the world’s top luxury brands in its extensive retail space, and more than a dozen restaurants, a pair of nightclubs, and a spa with 27 treatment rooms round out the offerings. The hotel is a must-see for animal lovers and first-time visitors to Dubai. Choose among a range of activities and tour options, including aquarium entry, scuba diving, and snorkeling. Experiences at the Atlantis Palm Hotel can last anywhere from 30 minutes to a full day. Out of respect for local customs, a cover-up over swimwear is requested when visitors are walking around the resort. To get to the Atlantis Palm Hotel, take the Dubai metro to Mall of the Emirates Station. From there, it’s a short taxi ride to the hotel. Dubai’s warm weather means there’s no bad time to visit the Atlantis Palm Hotel. Many of the attractions are indoors and air-conditioned, and the waterpark offers ample opportunity to cool off on a hot day. Dubai’s offshore islands have become some of the city’s most recognizable landmarks, and there are plenty of ways to experience them. See them from above aboard a helicopter or seaplane, or gaze down from the Burj Khalifa Observation Deck. From the Dubai Marina, speedboats, Jet Skis, and rigid inflatable boats (RIBs) zip visitors out to the Palm archipelago to see the islands and the towering Atlantis Palm Hotel from the water.